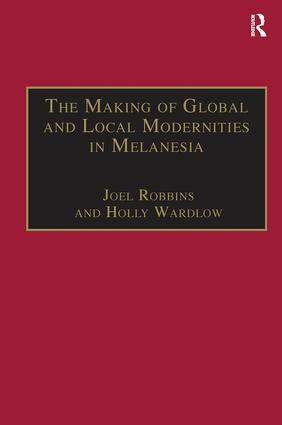 Authored by well-established and respected scholars, this work examines the kinds of efforts that have been made to adopt Western modernity in Melanesia and explores the reasons for their varied outcomes. The contributors take the work of Professor Marshall Sahlins as a starting point, assessing his theories of cultural change and of the relationship between cultural intensification and globalizing forces. They acknowledge the importance of Sahlins' ideas, while refining, extending, modifying and critiquing them in light of their own first hand knowledge of Pacific island societies. Also presenting one of Sahlins' less widely available original essays for reference, this book is an exciting contribution to serious anthropological engagement with Papua New Guinea. Contents: Series editor's preface; Introduction - humiliation and transformation: Marshall Sahlins and the study of cultural change in Melanesia, Joel Robbins; The economics of develop-man in the Pacific, Marshall Sahlins; The humiliations of sin: Christianity and the modernization of the subject among the Urapmin, Joel Robbins; Transformations of desire: envy and resentment among the Huli of Papua New Guinea, Holly Wardlow; 'We Are Not Straight': Bumbita Arapesh strategies for self-reflection in the race of Western superiority, Septhen C. Leavitt; Sepik river selves in a changing modernity: from Sahlins to psychodynamics, Eric Kline Silverman; ’We Are All "Les" Men’: sorrow and modernism in Melanesia, or humor in Paradise, Douglas Dalton; Moral and practical frameworks for the self in conditions of social change, Lisette Josephides; The death of Moka and polygamy in post-colonial Mount Hagen, Highlands, Papua New Guinea, Pamela J. Stewart and Andrew Strathern; On the life and times of the Ipili imagination, Aletta Biersack; On humiliation and class in contemporary Papua New Guinea, Frederick Errington and Deborah Gewertz; Turning to violence: hazarding intent in central New Ireland, Karen Sykes; Ancestral vigilance and the corrective conscience in Kwaio: Kastom as culture in a Melanesian society, David Akin; Afterword: frustrating modernity in Melanesia, Robert J. Foster; Index. Joel Robbins is Associate Professor of Anthropology at the University of California, San Diego, USA. Holly Wardlow is Assistant Professor of Anthropology at the University of Toronto, Canada. This series offers a comprehensive view of Asian and Indo-Pacific anthropology and cultural history. It carries studies from China, Japan, South-East Asia, South Asia, and the entire Pacific region, including Australia and New Zealand. Focusing mainly on detailed ethnographic studies, the series further incorporates pressing thematic work on issues of cross-regional impact, gender and globalization, precarity, refugees, and asylum-seekers, and alternative medical and wellness-seeking practices. The series aims to link anthropological theory with history and religious studies, with discussions of ritual, politics, religious change, and economics. Studies of adaptation and conflict in small-scale situations enmeshed in wider scale processes of transformation form a particular thematic focus. The series aims to reach a core audience of specialists in Asian and Pacific studies, but also to be accessible and valuable to a broader multidisciplinary readership.